On a cloudy Sunday afternoon in Dulwich, the Dodgers adapted swiftly to the 15 over format of the game. An excellent SCST Cricket Challenge tournament win ensued but, alas, no trophy for the victors. The consolation for an absence of silverware came in the form of a fine tea and post-tournament barbeque. Dodgers 138 for 4 (Sood 26*, Malins 26* & Dollin* 25) beat Dulwich CC 88 for 5 (Sood 1/7 & Shimoga (NJ)* 1/9) by 50 runs. 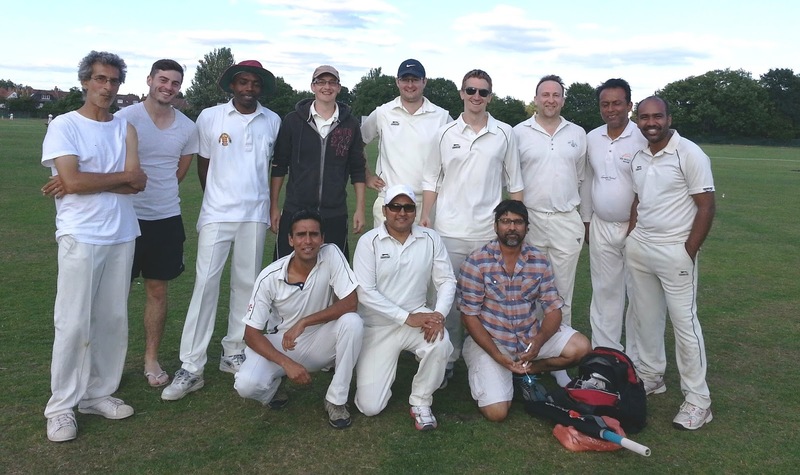 First up were Dulwich CC, a team containing a number of savvy seniors. Batting first, the Dodgers set an imposing target of 138. Openers Dolin (25no) and Malins (26no) set the tone for the rest of the day’s batting. In the middle order, Taylor (21no) scored quickly, kindly targeting the bowling of a friend of his in the DCC line-up from karate. The Dodgers score was further supplemented by some fine late hitting from Sood (26no). In response, Dulwich CC never threatened to reach the required run rate to challenge the Dodgers total and were 88 for 5 at the completion of their 15 overs. Following his display with the bat, Sood was the pick of the bowlers with a miserly, precise spell producing 1 for 7 from 3 overs. Dodgers 91 for no loss (Wahi 28* & Saunders 19*) beat KCHRFC 90 for 7 (Taylor 2/13 & Mayana 2/18) by 10 wickets with 3.3 overs remaining. Next up for the Dodgers came the plucky rugby club, who borrowed Cohen from the Dodgers following the arrival of Blair. The rugby club threatened some big hitting, having had a few retirees in their previous match against the SCST Select XI. Fortunately for the Dodgers this big hitting never materialised and, although a few made a useful start, wickets at regular intervals from the bowling of Gray, Mayana, Wahi, and Taylor ensured that none aside from Cohen managed to hit a big score. Blair also bowled with reasonable economy to limit the rugby club to 90 from their 15 overs. Although the order was shuffled slightly, the Dodgers made light work of chasing their target. Saunders, Naidu, Mallins, Taylor, and (most notably) Wahi made sure the Dodgers hit 91 from 11.3 overs. Dodgers 142 for 4 (Taylor 26*, Sood 24, Mayana 22 & Malins 21) beat SCST Select XI 84 for 5 (Naidu 3/21, Wahi & Saunders 1 each) by 58 runs. The tournament was poised nicely. Both the Dodgers and SCST Select XI had won both of their matches in convincing fashion and a close match was expected. Winning the toss, the Dodgers elected to bat. Dollin unfortunately fell quickly for 4 but Mallins (21) and Taylor (26no) hit quick scores off the SCST bowling. Mayana (22) and Sood (24) also hit impressive scores at a good rate and a A.N.Extra retired not out for 25. Occasional Dodger Mendelsohn was unable to prevent the Dodgers from reaching 142 for 4. In reply, SCST opener, Blackford, signalled his intent by lofting Naidu for 6 off the first ball of the innings. A close chase was anticipated but Naidu recovered in fine fashion to send Blackford’s stumps flying. He then removed two further threats; first bowling Thornton and then finding Mendelsohn’s edge. SCST fell further and further behind the required run rate, ending on 84 for 5 thanks to some good bowling contributions throughout the Dodgers team.